The Nice Guys Review | Nerd Much? It’s rare that a movie comes together so well in almost every single aspect that it truly feels like a genre-defining film. That genre in this case being the buddy cop, a mix of action and comedy primarily focused around two individuals that are a bit offbeat and typically compliment each other nicely. We’ve seen this style turn up more and more recently, with the most notable being 2 Guns. However, The Nice Guys doesn’t just succeed at making a great buddy cop movie, but also one of the best comedies in years. 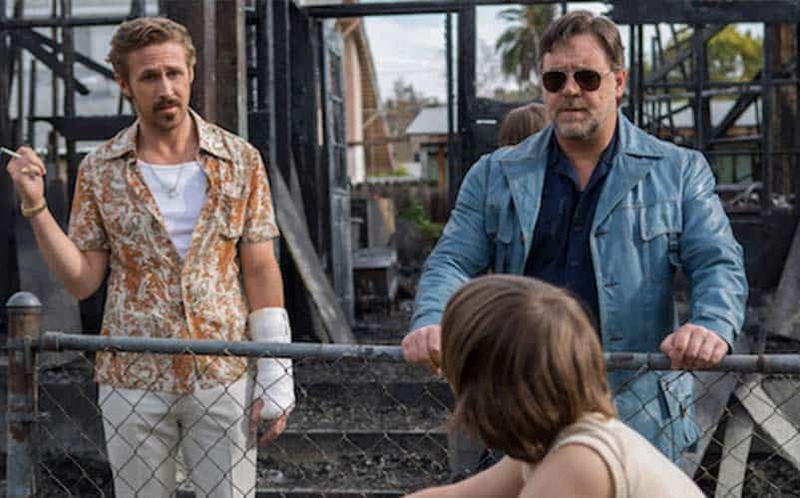 Directed by buddy cop genre legend Shane Black, The Nice Guys is set in 1977 Los Angeles, right when the city was transforming into a world of debauchery, booze, and prostitution. Even though it’s set in the late 70s, you can see the 80s action film genre love seeping through every crack of this movie. Black is a master at world building, even if it’s a world we are quite familiar with, and he does a masterful job at it here. Late 70s L.A. has never looked better (or worse? ), and the movie is filmed in a way that makes the city truly feel like a trip back in time. Pulling off period pieces set in major cities has always been tricky, but Black’s clearly defined eye for cinematography and film composition helps sell The Nice Guys‘s setting. Yet, a world is only as good as the characters inhabiting it, and Black knocks it out of the park here as well. Filling in for our buddy cop duo is Russel Crowe’s enforcer, Jackson Healy, and Ryan Gosling’s private detective, Holland March. Both of these characters feel genuine, and they may be some of the best the genre has ever seen, as neither adhere to the tropes we usually associate with this style of movie. One isn’t the wild one and the other the saint; both of these men are fairly despicable people who are just trying to get by. Yet, this somehow makes them more relatable as they are clearly struggling with what they are and the choices they have made during their careers. March struggles with alcoholism and the loss of his wife, while Healy is trying to do something that matters. There’s a lot of subtle development, which only helps to reinforce the story and strengthen the characters. This is also thanks to absolutely amazing performances by both Gosling and Crowe, who seem to be made for one another. Chemistry is one of the most important aspects between the leads in buddy cop movies, and both men dominate this movie. Gosling is the standout here, giving a funny and incredibly witty performance that will probably make March a staple of the genre. Thankfully, Crowe and Gosling do not need to support the movie on their own, as the supporting cast does a great job, mostly. Holly March (Angourie Rice) is a great foil and moral center point for both men, yet she never becomes too overburdening. Holly, in many ways, is just as flawed as her father, but the childhood innocence helps keep both the leads from spiraling into truly dislikable territory. For the villain side, most of them are fairly entertaining, serving more as the A-typical mob archetypes we expect from this genre. Beau Knapp and Keith David are funny as the colorful mobsters, while Matt Bomer does a commendable job as John Boy. It’s the latter that is of note, as he comes in around the mid-way point yet his entrance feels organic and natural to the story. The let down is Kim Basinger as her character, Judith Kuttner, feels cut from the movie for the sake of time. Her character is integral to the plot, yet she only has two scenes and that’s really it. It’s clear how important she is, as most of the driving action in the second is because of her, but her absence is noted. In a movie with various colorful characters, the more grounded one seems to have been shoved aside for the sake of time. Though her daughter Amelia (Margret Qualley) does have some fun scenes and a great twist near the second act, she also doesn’t make the best impression. Which is a shame given how entertaining the story actually is, as Black does a fantastic job subverting our expectations. Crime genre films are usually really easy to predict, especially buddy cop ones, as they typically stay firmly planted on safe ground. Thankfully, Black takes some chances around the second act that really pay off and probably would have hurt a lesser movie. Overall, the second and third act are far stronger, as the first one is really strangely paced. Of course, that’s typically the problem for most buddy cop films, as the plot really doesn’t start until both men meet each other. The Nice Guys also has a curious opening scene, that really feels out of place with the whole tone of the movie. It’s not bad, but it really felt unnecessary and forced into the script. Yet, these are minor gripes in arguably one of the best comedies since The Wolf of Wallstreet. While it may not redefine the genre, it certainly will become a staple of it. 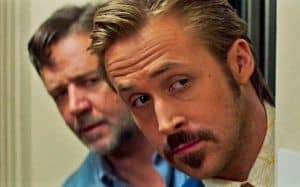 With fantastic performances, big laughs, and some subtle character moments, The Nice Guys is an entertaining ride you won’t forget anytime soon.